alaTest has collected and analyzed 129 reviews of Vizio M652I-B2 M. The average rating for this product is 4.1/5, compared to an average rating of 4.6/5 for other products in the same category for all reviews. Views about the durability and design are generally positive. The price and usability also get good comments, whereas some have doubts about the sound. We analyzed user and expert ratings, product age and more factors. 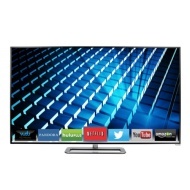 Compared to other products in the same category the Vizio M652I-B2 M is awarded an overall alaScore™ of 90/100 = Excellent quality. Pretty much everybody who responded asked for the M-Series. Ask, dear commenters and Twitterati, and thou shalt receive. Picture is not significantly better than less-expensive E-Series; color accuracy and video processing not quite as good as some competitors; below-average sound quality. Excellent picture quality, well thought-out features and distinctive design make the Vizio M-Series seem like a much more expensive TV than it really is. "A very nice TV for the price"
I've had this TV now for about a month. And, well.... It's BIG! A lot bigger than my previous set (replaced a Sony 40" Bravia). Big, Clear Picture, Great Colors, Good assortment of apps, wifi and LAN interface. TV Audio not great, no internet browser app.